Boston Crusaders posted two photo galleries captured during the corps' December rehearsal camp held in Florida. Check out the photos on Crusaders.com. Despite threatening winter weather forcing the Jersey Surf to cancel its December rehearsal camp weekend, more than 170 returning and prospective members showed up for the rescheduled rehearsal in Berlin, N.J. only a few days before Christmas. The corps notes a highlight of the weekend for members was a visit from Dr. David Kampschroer, former director of the Blue Stars, current chairman of the DCI Hall of Fame committee and one of the "founding fathers" of Drum Corps International. "Dr. Kampschroer's visit was a part of the evaluation process from the Drum Corps International Participation Review Committee," said Brian Prato, director of operations for the Surf. "The committee is responsible for evaluating corps seeking the opportunity to participate in Drum Corps International-sanctioned tour events, and in our case, is also responsible for making recommendations to the DCI Board of Directors regarding the application of corps wishing to move into the World Class," Prato said. Read more on JerseySurf.org. 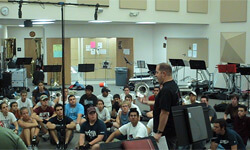 Pacific Crest recaps their "Fall Workshop Experience" in their first pocast installment for 2008. Interviewed is Chris Henderson from the corps' tuba section. Watch the video on PacificCrest.org. Phantom Regiment recently produced a video segment that gives fans a glimpse at two audition camps the corps held this fall and winter for prospective 2008 members. Watch the video on Regiment.org.